Cargo jacket, field jacket, anorak… call ’em what you will, but these outdoorsy-looking, military-inspired jackets have found a permanent place in my heart wardrobe. And yes, I did mean jackets, plural. I’m not ashamed to say that I am the proud owner of not one, not two, but three cargo jackets, in varying weights and materials, so that no matter the season, I’ll never have to go without this beloved piece of outerwear. Overkill? Perhaps. But the cargo jacket is so incredibly versatile that you can hardly blame me for relying so heavily on this Closet VIP! For more tips on how to wear some of my favorite wardrobe essentials, check out previous Closet VIP posts on how to wear: a striped shirt, a black skater skirt, a denim jacket, and a navy blazer. Basically the same, right? Moral of the story: a rose by any other name would smell as sweet, and a piece of outerwear with a drawstring waist, metal buttons, and cargo pockets by any other name would look as stylish. In terms of cut, there are definitely some differences, though: some jackets have a more pronounced drawstring that let you cinch in your waist, which is perfect for a curvier or hourglass figure. Since I have a more boyish, straight up-and-down torso and prefer to keep the focus on my legs, I’m more drawn to a boxier style. For these jackets, it’s easy being green: anything on the spectrum between olive to hunter green is the most traditional and versatile hue. However, as this type of outerwear gets more and more popular, there are all sorts of colors available. If you want to stay neutral, go for gray, tan, or black. For a fun punch of color, teal and burgundy are great options for fall! Make sure to tailor your purchase towards the local weather. After all, these jackets are meant to be super functional. (So many pockets!) Many versions I’ve seen come with hoods – bonus points if they’re detachable! The jacket I’m wearing in this post, made of lightweight cotton, is my spring through early fall jacket. The other two I own are a longer, slightly heavier field jacket from Gap (fall through early winter), and a quilted down Uniqlo jacket that’s perfect for wintry days. I think I can safely say that my $19 American Eagle Outfitters cargo jacket (pictured below) is, hands-down, the most worn item in my entire wardrobe. We’ve had a pretty amazing relationship, this jacket and I: we’re fast approaching our fifth anniversary together and I can’t imagine life without it. If you’re willing to splurge, Barbour makes the most beautiful waxed cotton field jackets that supposedly last forever. Plus, both the Queen and Alexa Chung are fans. If that’s not enough to convince you, I don’t know what will. 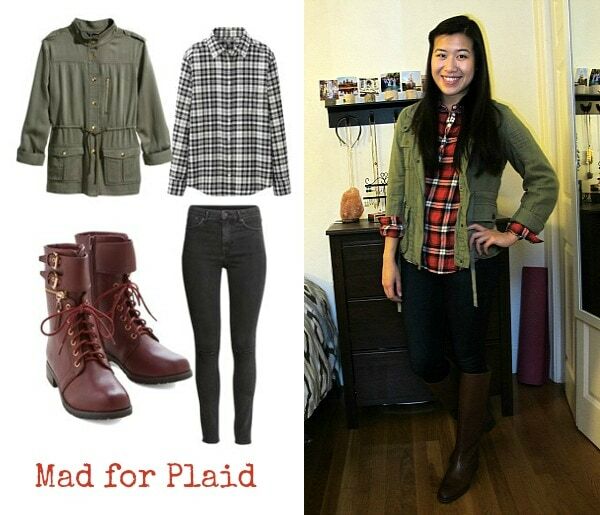 Cargo jackets and plaid go together like apple-picking and fresh cider donuts. Or like pumpkin spice lattes and college girls. Basically, they’re a match made in autumnal heaven, and you should not question their eternal appeal. For a night out, give the moto jacket a rest and reach for a cargo jacket instead. Not only will it keep you comfortable and warm, but the cargo jacket’s laid-back vibe will effortlessly pull your outfit together. It also helps to tone down a sexier look, whether it’s a bandage skirt or a crop top and faux-leather skirt combo. Don’t pack those breezy summer dresses into storage quite yet! 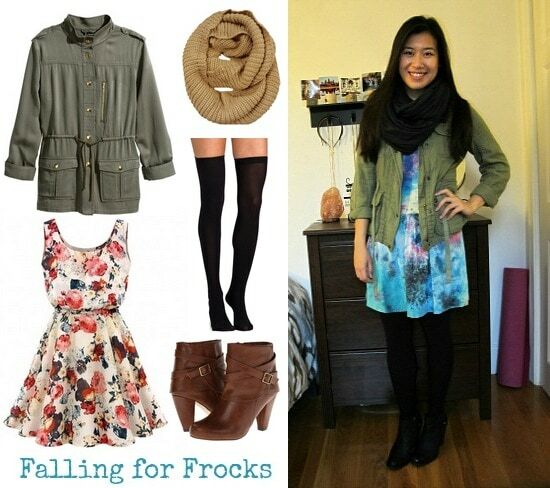 All it takes to fall-ify (that’s probably not a real word) your favorite sundress is a pair of tights, boots, and a warm scarf. And, of course, your trusty friend the cargo jacket! 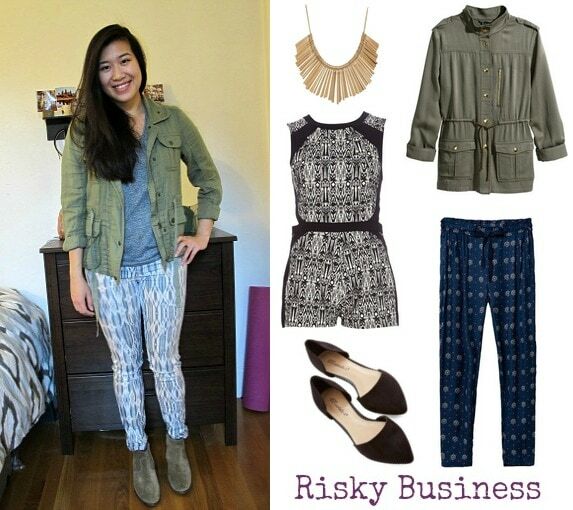 A neutral cargo jacket is a great foil for crazy prints or dramatic hemlines. Maxi dress? Patterned romper? Hi-low skirt? Awesome pants that you bought for €10 while you were abroad and happen to match your duvet cover? Put a cargo jacket on it! 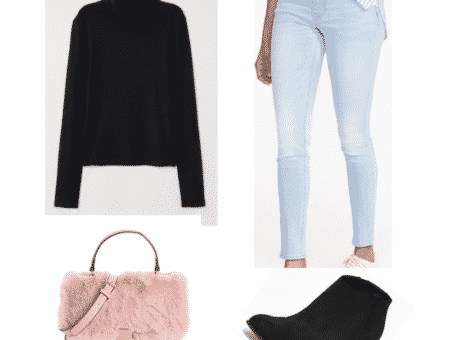 Would you wear these outfits? Do you have a dearly beloved cargo jacket, too? What’s your favorite way to wear it? Let me know in the comments! Previous Ask CF: How Can I Dress Professionally and Stay True to My Personal Style?